You are currently browsing the tag archive for the ‘1967’ tag. Chuck Jones returns to direct one final Tom & Jerry cartoon. Based on a story of his own, ‘Cannery Rodent’, like ‘Much Ado About Mousing‘ (1964) and ‘Cat and Duplicat’ (1967) is set in a harbor. Tom’s adversary this time is a large, purple shark, which looks like it has been borrowed from a Hanna-Barbera television series. 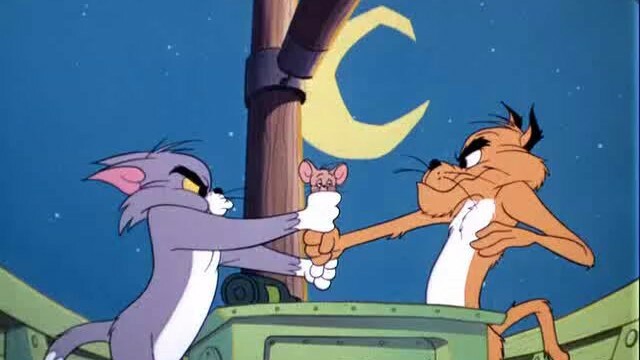 Unfortunately, Jones doesn’t seem to be inspired and the film is not a success, but just another boring entry in Tom & Jerry’s last theatrical series. To the next Tom & Jerry cartoon: The Mouse from H.U.N.G.E.R. After directing seven terrible cartoons, Abe Lebitow suddenly strikes with ‘Rock ‘n Rodent’. 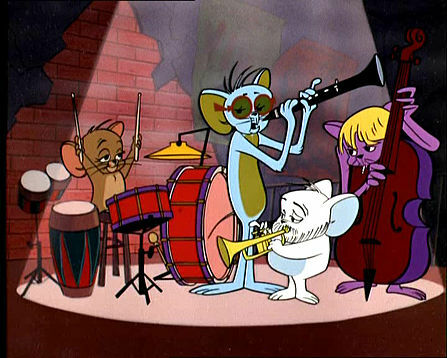 The story, by Bob Ogle, is inspired, if not anything new (it’s in fact the reverse of the classic Tom & Jerry cartoon ‘Saturday Evening Puss‘ from 1950): when Tom goes to sleep, Jerry rises to play drums with his hep-cat mice friends in the nightclub ‘Le Cellar Smoqué’. This, of course, keeps Tom awake, and he desperately tries to get rid of the mice, only to succeed in bothering a large bulldog living in the same apartment block. Unlike the other Tom & Jerry’s by Chuck Jones’s unit, this short has a lively jazzy score penned by a remarkably inspired Carl Brandt. In short, everything seems to come together for once in this cartoon, making this one of the best of the Chuck Jones Tom & Jerry’s. After ‘O-Solar-Meow‘ Tom and Jerry immediately return to the science fiction setting in ‘Guided Mouse-ille’. 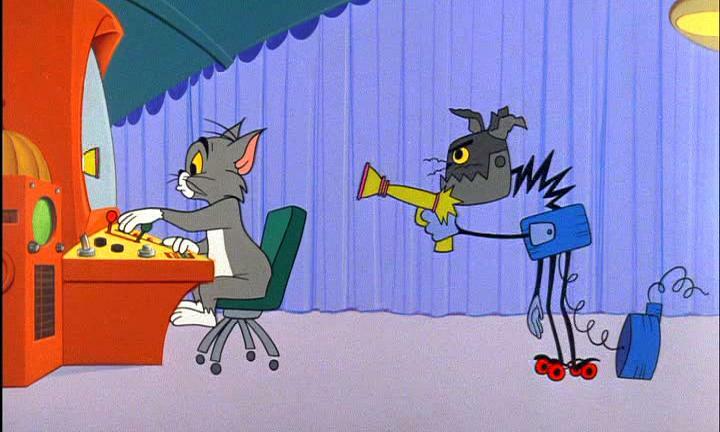 The time is 2565 AD and again, Tom and Jerry fight each other with modern technology, including the robot cat from ‘O Solar Meow’. In the end, our heroes are inexplicably blown to the prehistory, where they continue their chase. In a cartoon that looks forward to ‘2001 A Space Odyssey’ (which would be released the following year), Tom and Jerry inhabit a roulette-like space station. Here they fight each other using modern technology, including a robot cat. 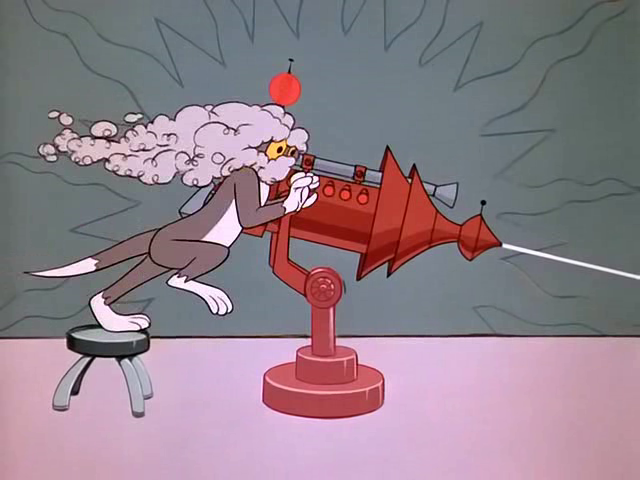 In the end, Tom manages to shoot Jerry to the moon, but luckily for Jerry, it turns out to be made out of cheese. 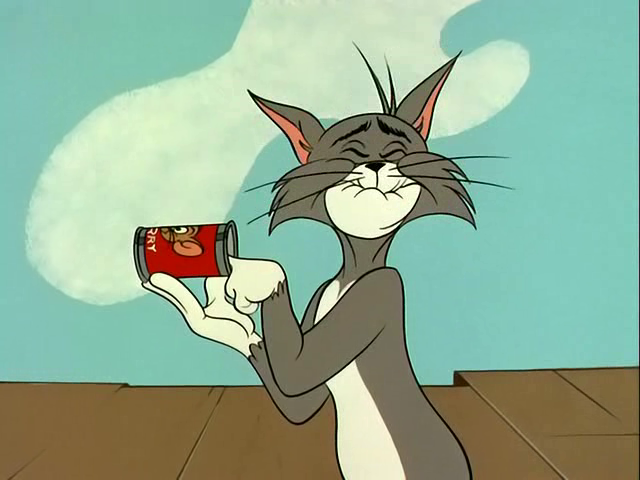 This cartoon contains nice settings and some original ideas, but none of them are executed well, resulting in yet another mediocre Tom and Jerry cartoon produced by Chuck Jones. Tom & Jerry’s next cartoon, ‘Guided Mouse-ille‘, also has a science fiction setting. Interestingly, both these shorts were penned by story man John Dunn. The harbor was a popular setting in Chuck Jones’s Tom & Jerry series. Like the earlier ‘Much Ado About Mousing‘ (1964) and the later ‘Cannery Rodent‘ (1967), ‘Cat and Duplicat’ is set in a harbor. Here Tom fights a rather dog-like cat over Jerry. The timing of this cartoon is remarkably slow and terrible, especially in an all too elaborate mirror routine. Eugene Poddany’s awfully sounding music wears down the action, like always. Even though not entirely successful, ‘The Bear That Wasn’t’ is a beautiful, highly stylized film, which uses some avant-garde techniques to tell its story, which makes it one of the most daring of the MGM cartoons, comparable to independent cartoons from the era. 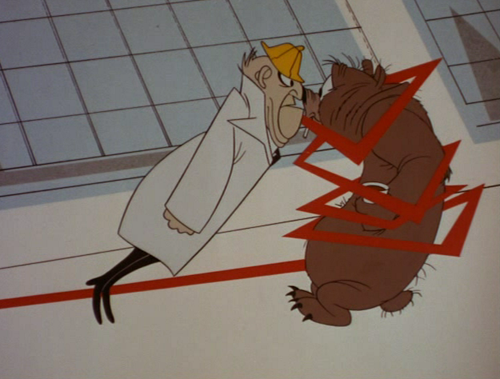 Based on the children’s book by Jones’s former Warner Brothers colleague Frank Tashlin, ‘The Bear That Wasn’t’ tells the story of a bear who ends up in a factory after hibernation, and who’s told he’s not a bear, but “a silly man who needs a shave and who wears a fur coat” so many times, he comes to believe it himself. The title of this cartoon can be translated as ‘life in a tin can’ and this is an apt title. In this cartoon Bozzetto reduces a man’s whole life to several minutes. The main character’s life takes place in and between depressingly tall grey buildings. He is only allowed brief episodes of sheer joy: during is boyhood, when he falls in love, and when he becomes a father. These short episodes are depicted by colorful pictures of nature, accompanied by lyric music. ‘Una vita in scatola’ must be Bozzetto’s most perfectly timed cartoon, and it is his first real masterpiece. ‘Prophets and Lessons’ is a Soviet propaganda film. It tells us how every time the Western world predicted the Soviet Union to fail, but that these predictions never came true. Its chapters are all conceived in the same order: first we see animated capitalist predict something, then we see a giant Soviet blacksmith strike his mighty hammer and finally we see live action footage of the Soviet Union’s successes. The separate chapters are the Soviet revolution, the civil war, the five year plans, the Second World War, the reconstruction after the war and the Soviet space program. The action is silent, and the imagery rather outdated (more like that of the 1920s than of the 1960s). 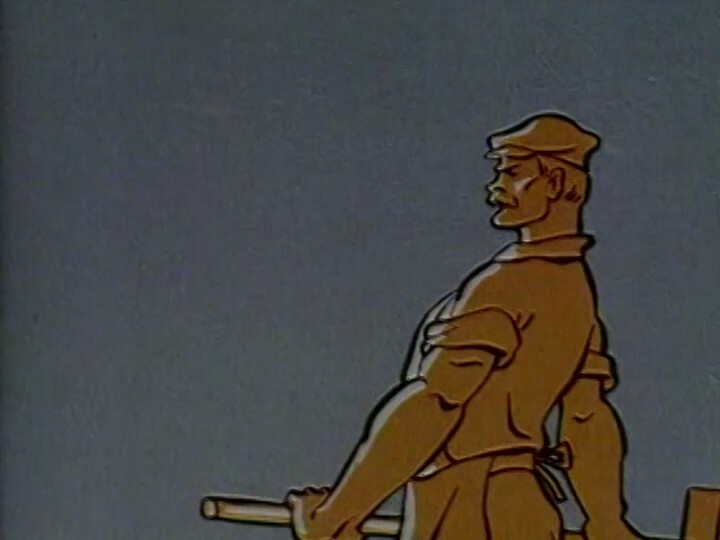 ‘Prophets and Lessons’ is one of the most obviously propagandistic animation films ever made in the Soviet Union. Its overtly propagandistic message, its repetitive character, and its outdated symbolism make it rather tiresome to watch. 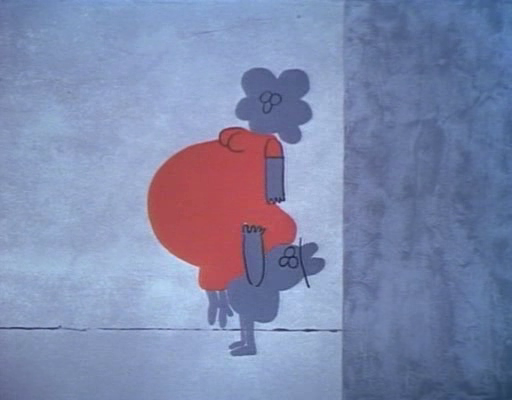 Surprisingly, two years later, the director of this humorless film, Vyacheslav Kotyonochkin, would launch a successful series of comic cartoons, called ‘Ну, Погоди!’ (‘Just Wait!’), featuring a very cartoony wolf. 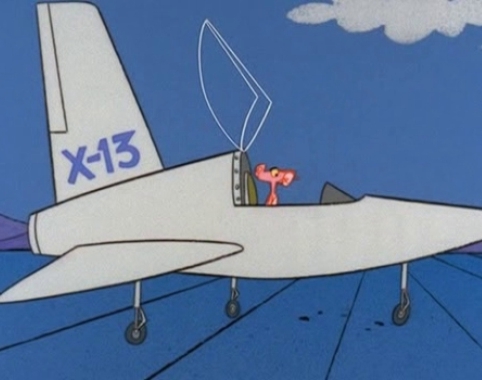 In ‘Jet Pink’ the Pink Panther enters a secret airport and climbs in test jet X13, which immediately goes astray. This cartoon marks former Warner Brothers animator Gerry Chiniquy’s debut as a director. Unfortunately, it’s far from an overnight success: ‘Jet Pink’ is inconsistent, and rather unfunny. The cartoon reuses the ‘count to ten and pull string’ gag from ‘Goofy’s Glider‘ (1940), but its execution is terrible when compared to the original. In ‘In The Pink’, weirdly enough, the Pink Panther is getting fat. So, our pink hero tries his luck at the gym, where he hinders the little guy a great deal. 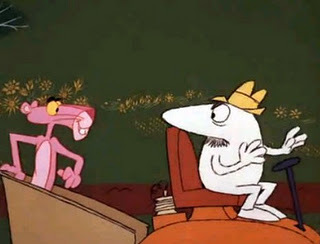 ‘In the Pink’ is an average Pink Panther cartoon, consisting of blackout gags, the most bizarre one being a chicken hatching a punching ball. The opening sequence reuses animation from ‘Pink Panic’ from earlier that year. 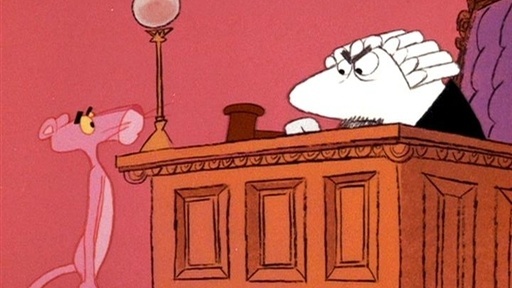 In ‘Pink of the Litter’, the Pink Panther is punished for littering by the little guy, who, in this cartoon, stars as a cop, a judge, a ranger, a fireman and a mayor. The Pink Panther has to clean ‘Litterburg’ from its rubbish. His methods include ‘instant shrink’ and making a giant paper plane out of the litter. This is an original cartoon with a great story using blackout gags, building up to a great finale. The very idea of the little guy appearing in different functions is brilliant. 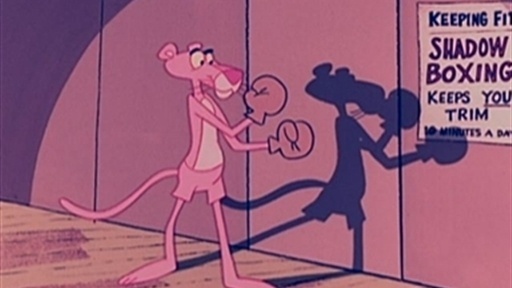 In short, ‘Pink of the Litter’ is easily one of the best Pink Panther cartoons. ‘Pink Posies’ could be summarized as ‘The Pink Phink‘ set in a garden: this time the little guy is a gardener planting yellow flowers, while the Pink Panther replaces them for pink ones. Most of the gags are variations on those in ‘The Pink Phink’, which make this cartoon a very enjoyable one, even though it’s not very original. The designs of this cartoon are also attractive, the very stylized trees in the background in particular.